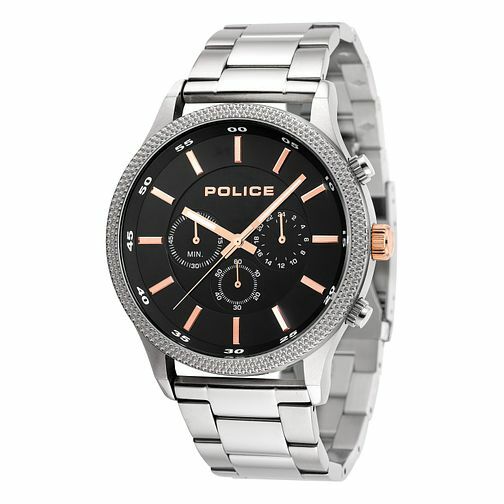 Stand out and turn heads with this men's watch from Police. Featuring a black dial set with eye-catching rose gold hour markers, time hands and logo, this watch is finished with a stainless steel case and sophisticated stainless steel bracelet. The perfect watch for those who want to make an impact with their look. Police Men's Stainless Steel Bracelet Strap Watch is rated 4.0 out of 5 by 1. Rated 4 out of 5 by Anonymous from Nice watch Good looking watch which my son loved, great value for money in the sale, only fault is the information leaflet included was not for this watch.